In episode 1 of the podcast, I chat with John Smith, a Deaf comedian from Beautiful BSL who has entertains the audience across the world using sign language. John has also appeared in various press and TV too, as well as performing in theatres and clubs. Ahmed: Welcome to the Hear Me Out! [CC] Podcast, the show where you’ll hear from inspiring people in and around the deaf community and from your host, Ahmed Khalifa. Ahmed: Yes, welcome to episode one of Hear Me Out! [CC] Podcast, and I’m going to be interviewing John Smith from BeautifulBSL.co.uk. 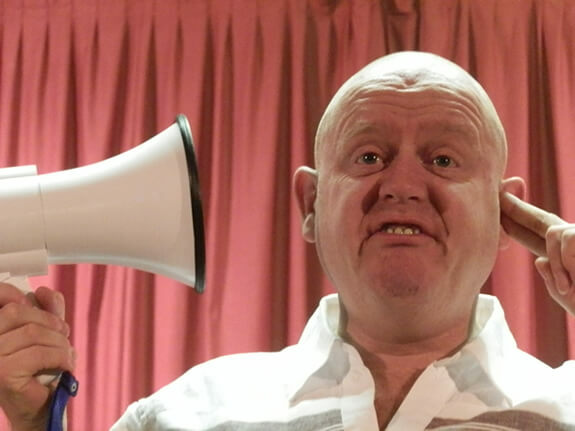 John Smith is a Deaf comedian, and he entertains audiences in deaf club in theatres, not just the UK, but even across Europe, USA, kind of the world really. Ahmed: And he uses sign language, so kind of visual comedy to entertain a crowd I’ve got with BSL did a lot of emotive reaction than use your facial expression, that kind of stuff as well. So I reached out to John to interview him because I thought I would save it into it and I wanted to know more about him and how kind of gotten good you as well. Ahmed: But of course because John is profoundly deaf, he had kindly given me some, answered the question that I had for him by getting someone to put it together and uh, he interpreted it and defend it over to me. Ahmed: So I will be reading out the answers that John has provided for me by email, so I appreciate that, John. Thank you very much. Ahmed: And why don’t we get started on the first questions that I asked him about his background and about his upbringing, the kind of, his hearing loss journey, the challenges that he faced and how did you overcome it? That kind of stuff. Ahmed: So this is John’s answer. John: I was born hearing, I became Deaf when I was 3 through meningitis. I was the only Deaf in my family and non could sign nor learned how to sign. I went to a school with a partial hearing unit PHU. Here we was not allowed to sign and was taught through the oral method because historically sign language had been banned and the oral method was preferred. John: At break time we would sign but the hearing children from the rest of the school would laugh and say we were disabled and looked like monkeys using BSL as a form of communication. John: For a brief time I believed them and made fun of other Deaf people to try and fit in but I later realised I was wrong and felt like a fool for doing this. I found my Deaf identity and felt proud to be Deaf, to use BSL and realise yes I am Deaf and I can achieve so much. John: Growing up I faced barriers I wouldn’t say they were overcome; you just accepted them and had to put up with them. Meal times everyone would be chatting and I wouldn’t understand any of it. Sitting watching the television there was no subtitles in those days, it was really difficult. I couldn’t communicate with my family, they did not understand me. Ahmed: That’s such an interesting thought, isn’t it? I mean the fact that it was banned and you can’t even use your preferred method of communication. That kind of amazing to hear that that actually existed and compared to today where actually it’s recognized official language in the UK as well. Ahmed: And it sounds like very tough because obviously we didn’t have the technology that we have today, for example, subtitles and all the hearing aids technology, and these kind of stuff, and John didn’t have access to them. Ahmed: But I guess in that time he kind of found himself anyway and got his identity and got to where he is today. Ahmed: So the next kind of question that I’ve asked John is about being a deaf comedian. How did he get into it? The themes that he used and the inspiration that he get. And also the challenges that he faced en-route to that journey, and what advice he has for those who want to get into the performance and art industry, but they’re also deaf as well. Ahmed: So here’s John’s answer to these questions. John: I am naturally funny, I have humour and all my life been able to make people laugh, many people over the years told me you should be on stage and I always would brush it off or refuse because I was too shy. John: My comedy act is about my experiences, from my past and present. Everyday things and people I encounter. I draw on comparisons between the Deaf and Hearing world along with the cultural differences. When I watched Peter Kay and his comedy act seeing him talk about his life and the way he portrayed it, that’s when it clicked that’s when I realised what people had been saying I could tell my experiences on stage. John: I found becoming a Deaf comedian was a easy transition to make, as people were right I should have been on stage long before I actually built up the courage to do it. The first time I did a gig of course I was nervous. It’s good to be nervous. John: I don’t think I have faced many challenges as I work with mostly Deaf audiences or people who have a good understanding of the Deaf world. I would say if anything when a person who has no knowledge of the Deaf world comes having an interpreter to translate my sign is the easy part the hard part is the understand who culturally we are so different, that is the most challenging thing to convey how our worlds really are completely different, many are shocked when they realise the barriers we face every day and some even feel embarrassed at how ignorant they have been. John: My advice to anyone who wanted to get into the industry and perform would be to do it. Not to over think it and do it. Don’t let anyone tell you that you can’t because you are Deaf. Be prepared to work hard and ride out the bad times with the good. Ahmed: Very fascinating. Really, really interesting and I love the part that he learned from Peter Kay, Peter Kay, who is a well-known English comedian, he’s not deaf. He uses the kind of standard thing that you see on tv, using expressions and shout and jokes and engage with the audience. That kind of stuff that you know, kind of a thing that most people in the hearing world are familiar with. Ahmed: But he’s not deaf. But John Smith still took inspiration from him because of his story, the way he conveyed himself, the way he kind of presented himself to the audience and make it funny. And I’m going to put in the show note the kind of comedy that John had done. There are so many videos out there and he had appeared in so many places on TV and on the media as well. Ahmed: So I’ll put in the description his website, but also a few videos that will be embedded so you can have look at the kind of comedy experience and stories that John tell his audience using BSL. Ahmed: And I find that really interesting. It can be quite funny as well, but of course for the hearing world, it’s a completely different experience as well. So check it out in the show note and let me know what you think as well. Ahmed: The best thing about being Deaf, and advice for people who are hearing when they around deaf people and advice for those who’s living with hearing impairment in making the most out of their lives. Ahmed: And this is what John has said to me. John: One thing that frustrates me is how much ignorance there is towards the Deaf Community. People think because I am Deaf I am stupid and can be really condescending towards me and many others within the community. It frustrates me how any people seem to have a phobia about Deaf people – they seem to run and hide, I have had hearing people admit that they’ve done that in the past. John: I don’t think there is any worst part about being Deaf, I would chose to be Deaf over hearing anytime. I love the rich culture, community and history we have and embrace it. My advice to a hearing person would be to make themselves Deaf aware. Find training, research it online or ask the community, there is honestly no need to have a phobia. John: I would also tell them never say to a Deaf person “oh it doesn’t matter” upon realising that the person is Deaf there is no worse feeling than that. Take the time to explain, repeat it use mime and gesture or write it down. If you are in a social situation make sure you include the Deaf person and no =t to leave them feeling isolated. John: My advice to anyone who is Deaf? Be positive. See it as a positive challenge. Ahmed: Isn’t that great? I like how it kind of ended the mini interview I had with John and it’s sad to hear that you know, that how people view the deaf community that they think they are stupid and they kind of taunt him about. Ahmed: And we’ve heard that earlier about how John said in the kind of upbringing that he had people who are treating him and said that he looked like a monkey because he was using BSL, which is very sad to hear. Ahmed: But the fact that despite all that he still chooses to be deaf over hearing and maybe of course he didn’t have that upbringing in the hearing world until the age of three and then kind of declined after that. But still the truth to be deaf over here and because of what’s involved in the community, the culture, the history, the people. Ahmed: And it kind of made him. So it shows that, you know, there are so many people out there who would happy to communicate with you. There are ways around it. Ahmed: Another thing I would say to you can use technology if you get your phone and just type it out in your text message and show it to them, that can work as well. And of course if you’re communicating with someone you don’t have to call them. You can send them the messages, obviously using text messaging or WhatsApp or email whatever we have, so there are plenty of ways you can kind of communicate with them. Ahmed: And I totally understand what he means when people say, “oh, it doesn’t matter.” It seemed to be like the most common thing to hear from hearing people, when they realize that either you can’t hear it, oh, didn’t realize that you are deaf or didn’t want to repeat again. Ahmed: …and you do that wave thing like just brush you off kind of thing. It is very frustrating because you made that effort and then you realize, you know what? It’s not important enough. I’m going to tell someone else. Ahmed: A lot of people have said that to me that that’s how they feel, so be aware of that. Make the effort to explain. It could be the environment, it could be very, very noisy. It could be the wrong kind of lighitng and you can’t see face-to-face, so you can’t lip read. It could be anything like that. Ahmed: So never ever, I said it before in a video that you should not say, “oh, it doesn’t matter”, ever. Not. Who Really, really bugged me off. I don’t know why I’m laughing about it. I’m just like in shock that people say it to me in this day and age, but end of the day, don’t do it. Ahmed: So I think that kind of rounds up what John said. As I said, I’m going to put everything in the show note because his website, he has, you know, you can buy DVD and accessories from him, a bit more stories about him, a few more videos, but as I said, in the show note, I will have all that in there as well, and you can read about it. Ahmed: And just understand that story, that you can be a deaf comedian and you can enjoy that as well. So of course for those who are not deaf or don’t understand BSL, on this occasion, you will see like a subtitle or captions in there and you can engage with it as well, you can enjoy it as well, which is great, I think. Ahmed: But you know how many people would say that they know a deaf comedian or that you can be deaf and a comedian. A lot of people wouldn’t believe it, but you can. It just shows that anybody can make the most out of your life, even if you’re deaf is kind of amazing. Ahmed: So John, if you are reading the transcript, which will be in the show note as well, I appreciate it. Thank you very much for providing me with the transcript, ith the interpretation of your BSL. I really appreciate it. And, uh, I hope to communicate with you again soon. Ahmed: In the meantime, I’ll see you next time. Take care! Ahmed: Thank you for listening to the Hear Me Out! [CC], courtesy of hearmeoutcc.com.